You'll be £8.00 closer to your next £10.00 credit when you purchase Julius Caesar’s Disease. What's this? It is generally accepted as a historical fact that Julius Caesar suffered from epilepsy, an illness which in classical times was sometimes associated with divinely bestowed genius. The ancient sources describe several episodes when, sometimes at critical junctures, one of the most famous military commanders in history was incapacitated by his illness referred to as morbus comitialis. But does the evidence really fit with the diagnosis of epilepsy? And if it was not epilepsy that afflicted Caesar, then what was it? These are the questions that doctors Galassi and Ashrafian seek to answer by applying modern medical knowledge to the symptoms and circumstances described by contemporary historians and commentators of Caesar’s life (which include the great man himself). The result is a fascinating piece of historical-pathological detective work that challenges received wisdom about one of the most famous men of all time. If you are interested in paleopathology, Francesco Galassi and his colleague, Hutan Ashrafian, recently published their book - "Julius Caesar's Disease: a new diagnosis". Not only does it give a new perspective on what may have afflicted Caesar, it also gives you a peek into the process of diagnosing the past through paleopathology. It is a fascinating read and I would highly recommend it. Dr Galassi is a paleopathologist at Zurich University; Hutan Ashrafian is a surgeon and paleopathologist at Imperial College London. Both men are perfectly well qualified to re-examine Caesar's symptoms and to offer an alternative diagnosis to the well accepted one of epilepsy, which was considered to have been a divine illness which bestowed upon Caesar the favour of the Gods and therefore elevated him above other, ordinary mortals. The book examines the possibility that Caesar's symptoms also fit the characteristics of ministrokes, or TIAs, as we now also call them. Julius Caesar remains the most fascinating of all ancient Romans, and the two authors keep his legendary status in mind whilst proposing their diagnosis and at the same time entertaining their readers. I am of course not qualified to comment on their findings or proposed diagnosis, but I found the book to be both readable and informative, and a worthy addition to the various biographies of the great man, most of which concentrate on his military prowess and politics. A most fascinating read. 5* - Julius Caesar reportedly suffered from a “falling sickness”, which many have interpreted as epilepsy. Is that conclusion securely based on factual evidence? In a dazzling display of classical scholarship combined with detailed medical know-how, Francesco Galassi and Hutan Ashrafian valiantly tackle this question. But this account is far, far more than a narrow case study. Regardless of whether the authors’ promising alternative hypothesis wins the day, Julius Caesar's Disease is a fascinating historical account of Caesar’s life. Laced with judicious irony and gentle humour, it reads more like a detective story than a medical history and takes the reader on a hugely rewarding voyage of discovery. 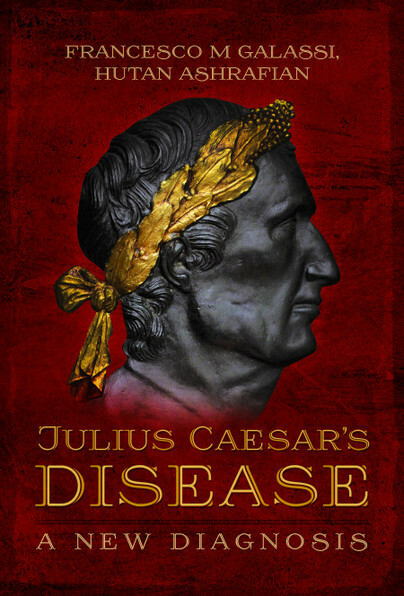 Whether you are a history buff, an aficionado of medical antecdents or simply a lover of mysteries, Julius Caesar's Disease is a delight to read! We will never know for sure whether Caesar actually suffered from TIA, which the authors themselves acknowledge, but thanks to them a thorough biomedical profile has finally been made available for paleopathologists, historians, philologists and neurologists alike, who will then be able to expand their researches on the matter. For the ordinary history lovers, however, this book allows them to feel closer to Caesar, the real man who lived before his myth, and like him perhaps dreaming of eternity. Galassi and Ashrafian debate at length the literary evidence provided by Caesar's principal biographers and other authors of antiquity. Importantly, they provide citations from these works in the original Latin and Greek texts with accompanying translations into English. Two citation, from Plutarch and Appian, strongly support the view that Caesar suffered from epilepsy, whatever the cause. Irrespective of whether one agrees with the authors' conclusions, this books is thoroughly researched and referenced, well-presented, and will be of interest to anyone with a keen eye into the past, especially to historians of medicine. Methodologically faultless study, the Authors propose a fascinating hypothesis, scientifically strong, but without forgetting the narrative aspect! Pleasant reading, I strongly recommend it! I enjoyed this book very much. Like in a detective story, Caesar's disease is studied with great attention to the slightest details. A must for all those who love the classica world, history and medicine! This a truly fascinating book and an enjoyable read. The authors examine Caesar's disease perfectly combining medicine and classics. It will probably never be possible to find out what he really suffered from, but this book really highlights the evidence in the sources and the unlikelihood of Caesar's epilepsy. I strongly recommend it! Hutan Ashrafian, BSc Hons, MBBS, MBA, PhD, MRCS is a surgeon, historian, systems biologist, biostatistician, paleopathologist and philosopher. He is currently lecturer in surgery at Imperial College London and surgeon registrar at Chelsea and Westminster Hospital in London. His historical and paleopathological work spans the era of Alexander the Great and the classical world, epistemology and the earliest world literature from the Ancient Near East, art and science in the renaissance focusing on the work of Leonardo da Vinci. As an Egyptologist, he has offered the first pathological analysis of the Great Sphinx and his analysis of the death of Tutankhamun was featured in documentaries on the BBC and the Smithsonian Channel. He is the founding president of the Institute of Polymaths. Francesco Maria Galassi, MD, is a paleopathologist at Zurich University’s Institute of Evolutionary Medicine, where he serves as Assistant and Principal Investigator of the Italian Paleopathology Project. He graduated from the University of Bologna and has collected research experiences at the University of Oxford and Imperial College London. Besides studying osteological remains and mummies, he specialises in the analysis of ancient texts in order to identify the historical presentation and evolution of diseases throughout history. Amongst his most acclaimed studies, the causes of death of Alaric I and Giovanni Boccaccio. Aged only 27, Francesco Galassi is one of the youngest palaeopathologists in the world and already an expert in the field of palaeomedicine. Francesco’s studies have received worldwide attention in quality papers such Forbes Magazine, The Guardian, The Telegraph and he regularly features in the press and radio-TV programs as commentator of paleopathological research.